Lost iPhone contacts when you try to update or restore your iPhone? Or just delete some important iPhone contacts by mistake? This definitely causes lots of troubles for us. However, you still get the chance to get back your deleted or lost iPhone contacts. We will offer three practical solutions to recover iPhone contacts in this tutorial. Lost your iPhone contacts mistakely, moreover you haven't made any backup before? In this situation a professional iPhone data recovery software would help. Remember the first thing you need to do after iPhone losing contacts is to stop using it and keep it in a safe place, in case of the lost contacts being modified, overwritten or corrupted. 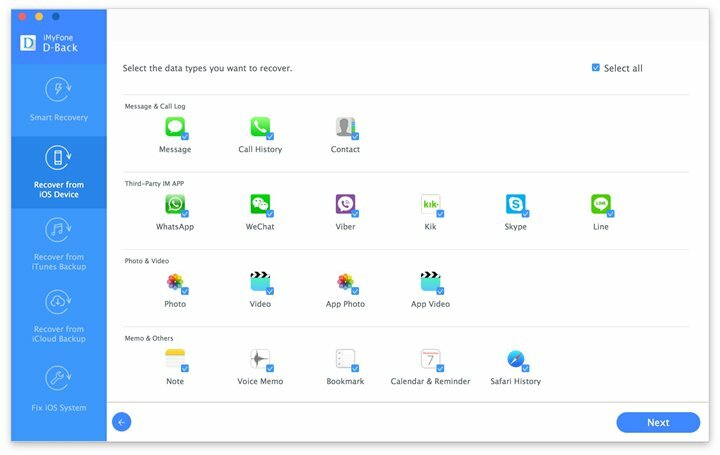 iMyFone D-Back Data Recovery or iMyFone D-Back Data Recovery for Mac is a professional iOS data recovery tool to help you preview and recover deleted contacts from iPhone even if they are not backed up to iTunes or iCloud. 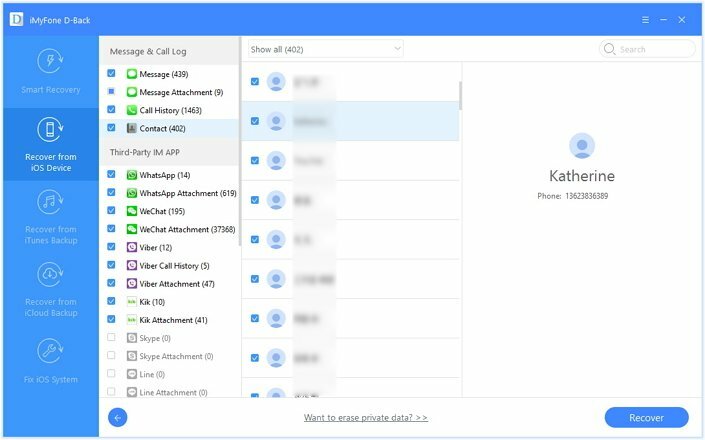 Besides contacts, this tool also recovers data including text messages, photos, call history and more for your iPhone, iPad and iPod Touch. The Smart Recovery mode will intelligently choose the scan and searching routes from iDevice, iTunes backup or iCloud backup to recover contacts iPhone. Built-in preview function allows you to check your contacts in detail so that you can simply select the ones you need to recover. And this preview function also save quite a few time for you. Not only contacts, iMyFone D-Back also supports to recover text message, photo, video, call history, voice memos, note from iPhone SE/ 6s/ 6s Plus/ 6/ 6 Plus, iPad Pro/ Air 2/ mini 4 and more iDevices. With only three steps, you can restore your lost iPhone contacts safely and quickly. Step 1: Choose "Recover from iOS Device"
After you download and run the program on your computer, you need to choose the recovery mode in the left-hand sidebar. Simply click "Recover from iOS Device". Then choose the lost file type by checking the box before “Contact”. 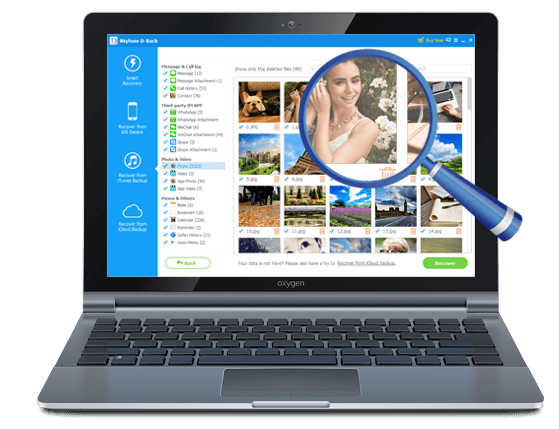 By the accurate selection, iMyFone D-Back will only scan the files you’ve chosen instead of all file types to save your valuable time. Connect Your iPhone to the computer. iMyFone D-Back will detect your iPhone and ask for your permission to scan the lost or deleted contacts on your iPhone. After the scan, you can browse all the contacts or only the deleted ones by enabling “Only show the deleted ones”. Select the ones you need and click “Recover” on the right bottom corner. 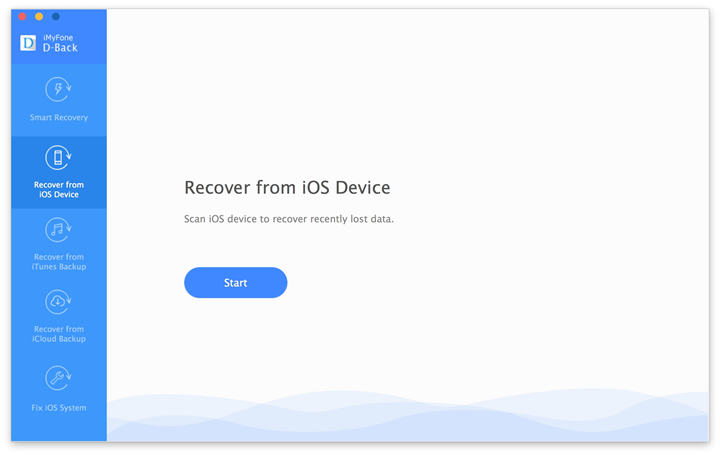 Now, the free trail version of iMyFone D-Back iPhone data recovery or iMyFone's iPhone data recovery for Mac is available for both Windows and Mac. Just download it to recover your lost iPhone contacts! Step 1. Firstly, you need to run iTunes on your computer. Step 2. Connect your iPhone with your computer to make iTunes detect your iPhone. Step 3. Then right-click iPhone icon and select “Restore from backup”. Step 4. Choose the most relevant backup file and click “Restore”. Note: A fully restore method will erase all your content and settings on your iPhone. The data created between the moment you made the last backup and the moment you restore the iPhone will be erased during the progress. 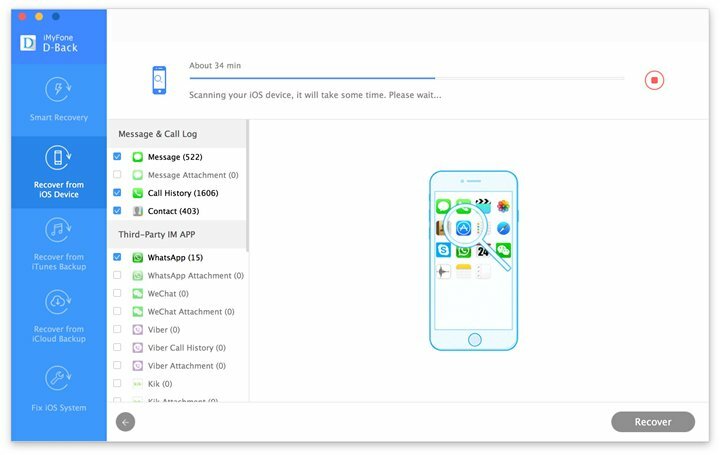 iMyFone D-Back will help you sort this out: it supports to extract deleted iPhone contacts from your backup files to your computer without overwriting current on your iPhone. Step 1: Choose "Recover from iTunes Backup" in the left sidebar and choose the contacts in ths file types page. Step 2: Choose the most relevant iTunes backup and let iMyFone D-Back scan all the contacts files in the backup file. Step 3: After scanning it will display all the recoverable contacts including the current and deleted contacts. 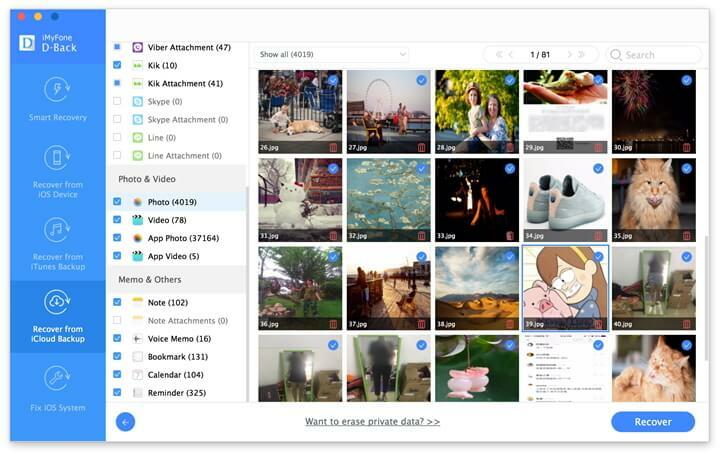 Preview, choose and recover the files you want to keep. Step 1: Go to "Settings" > "General" > "Reset" > "Erase All Content and Settings" > "Erase iPhone" on your iPhone. Step 2: After your device iPhone restart, tap "Set Up iPhone" > "Restore from iCloud Backup". Step 3: Then log in your iCloud account and choose a backup file. Let it download the iCloud bakcup file onto your iPhone. Wait for the progress to complete. 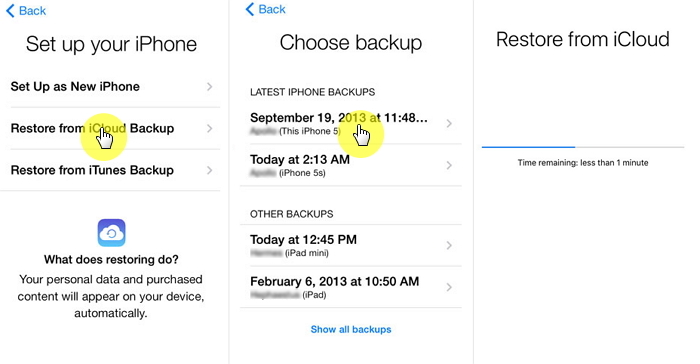 Note: Your data and settings on your iPhone will be overwritten by the backup you pick. Step 1: Open https://www.icloud.com on web and login. Step 2: Then click “Contacts”. 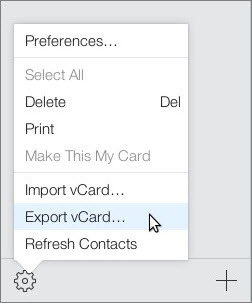 Step 3: Once you get into the contact window, click setting icon on the lower left bottom and click “Export vCard”. Step 4: Next, save this file on your hard disk drive. Finally, you just need to send this file via email and open it on your iPhone to get them back on your iPhone. 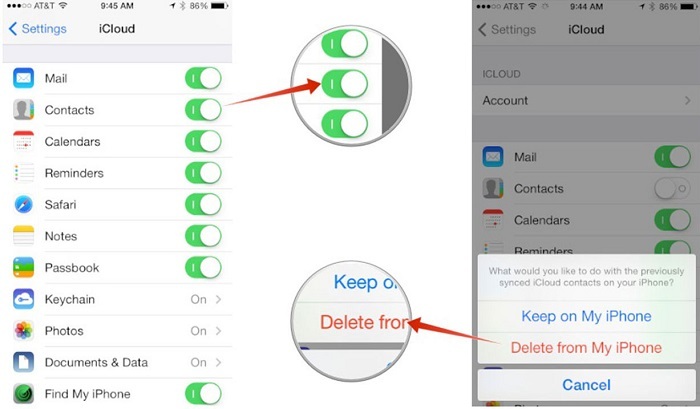 Firstly check if the deleted/lost contact is still visible under contacts on iCloud.com. If yes, just follow the steps below to recovre lost contact easily. Step 1. Go to Settings > iCloud on your iPhone. Step 2. Turn off Contacts. Step 3. A popup message will come up and ask you what would you like to do with the previosly synced iCloud contacts on your iPhone, choose keep on My iPhone. Step 4. Now, turn on the contacts again and press “Merge”. Step 5. Wait for some minutes, you should find the deleted contact back on your iPhone again. 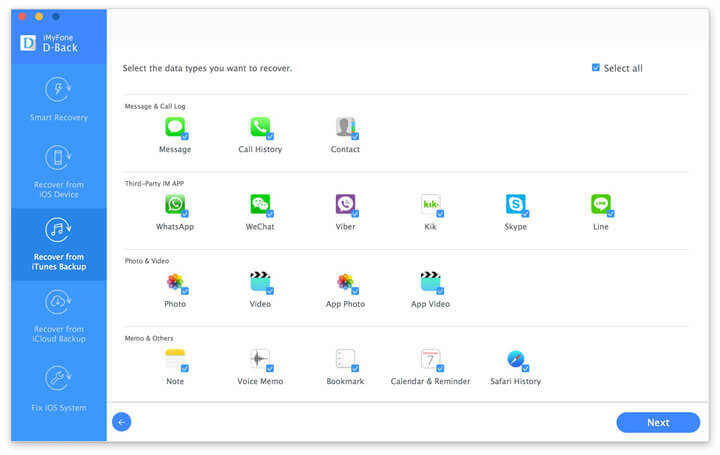 iMyFone D-Back iPhone data recovery Win or iPhone data recovery Mac supports also to extract data from iCloud backup. Just run the program on your computer to extract deleted iPhone contacts selectively from your iCloud backup. Step 1: Choose "Recover from iCloud Backup"
Choose "Recover from iCloud Backup" tab and click start. Then select the file types you want. Log in your iCloud account and select the most relevant iCloud backup to download. After scanning, iMyFone D-Back will display all the scanning result on the interface. 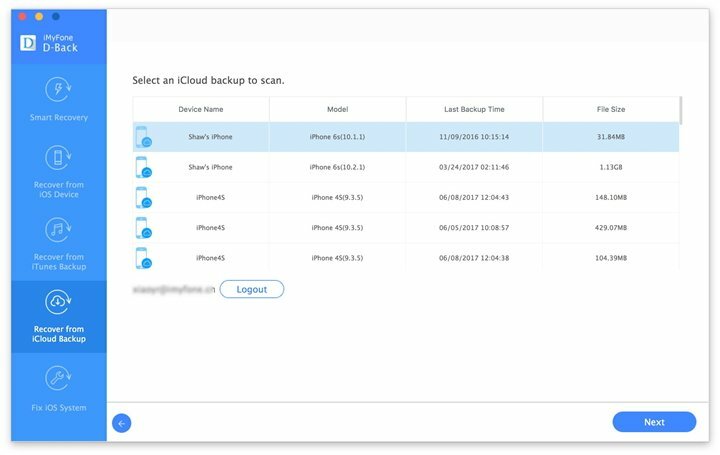 Preview, choose and recover the lost contacts from your iCloud backup easily. 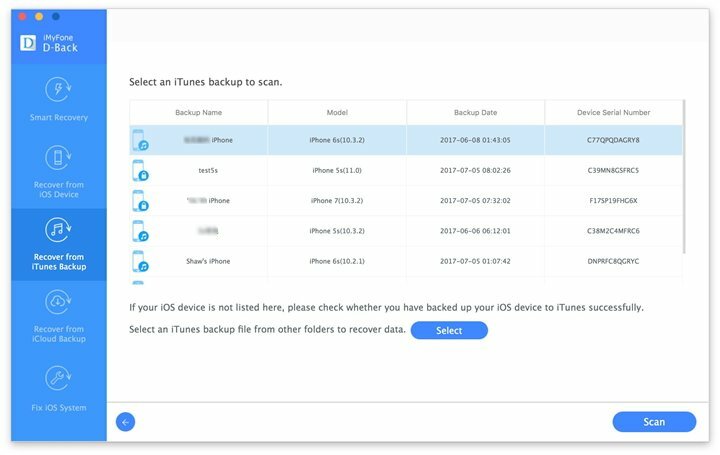 Now download this software to recover contacts directly from device or extract the wanted filed from your iTunes/iCloud backup file! Tips:To avoid irreparable loss of important files, you'd better backup your iPhone data frequently. I never have to worry about losing all my contacts again! iTunes and iCloud do have some disadvantages and they are not always helpful and I had to choose the iMyfone D-Back. But fortunately it is helpful. It is good to know that iMyfone D-Back could help you to recover your contacts!